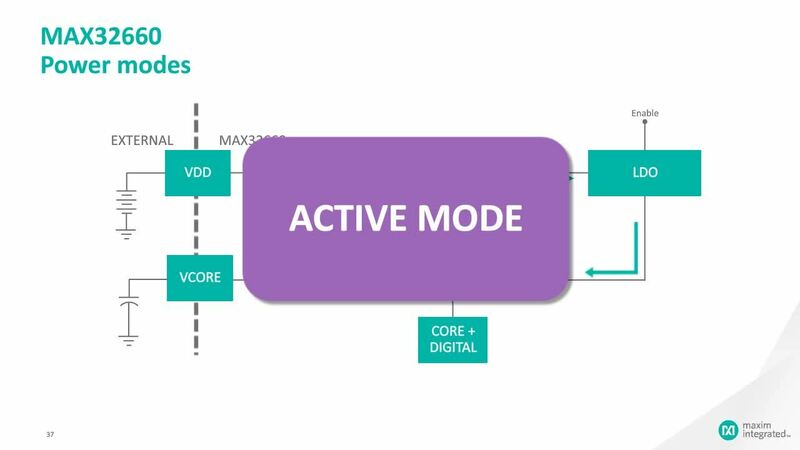 Maxim’s MAX32620FTHR# is a development platform designed to help design engineers implement the battery-optimized solution of the MAX32620, an Arm® Cortex®-M4 microcontroller with floating point units (FPU). This development board also includes a MAX77650 ultra-low power PMIC and a MAX17055 fuel gauge to provide efficient power conversion and battery management with minimal board space. The boards include a dual-row header footprint that is compatible with breadboards and off-the shelf peripheral expansion boards. There are two 12-pin Pmod™ compatible socket connectors for more expansion options. Also included are two common user-interface peripherals with RGB indicator LEDs and pushbuttons. These options provide a power-optimized flexible platform for quick proofs-of-concept all in a small form factor of 0.9" x 2.0". MAX17055EWL+ Fuel Gauge Maxim’s MAX17055EWL+ fuel gauge provides precision measurements of current, voltage, and temperature. Build More-Effective Smart Devices: Part 2 – Secure Design Developers can use secure MCUs and authentication ICs to meet users' expectations for privacy and protection in smart products. Build More-Effective Smart Devices: Part 3 – Processor Performance Using a family of 32-bit MCUs to build invisible intelligence into wearables and IoT devices while optimizing for low power.